We are proud to provide Superchutes for all your garage chute needs. Superchute provides a superior product will great safety built in. 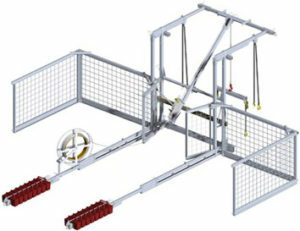 All chutes are equipped with 10,000lb strong cable (breaking strength 20,000) assemblies that join each chute together. The working load of the chutes are 2,000lb, giving the chute a 10:1 safety ratio. Trash Chutes can be installed in many different ways (Window Mount, BOlt Down, Scaffold Hoist, or Roof Hoist) to fit your need. The trash chutes are assembled quickly and safely by as they are hoisted into place.